Khenpo SoDargye, who was ordained at the Larung Gar Five Sciences Buddhist Academy nearly 30 years ago, will speak of the founding and development of Larung Gar and describe the rich and diversified academic programs the Academy provides. Larung Gar, 2014. (Photo: Bodhicitta/ Flickr; cropped). CC BY 2.0. 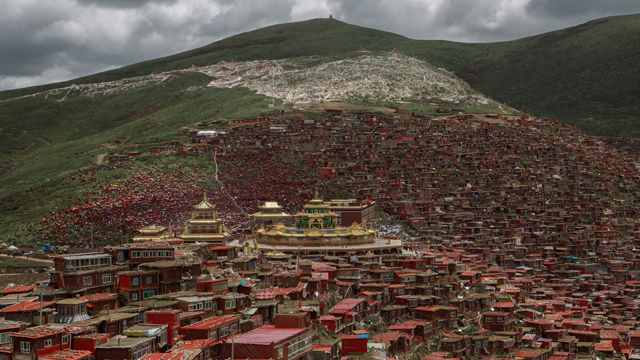 The Larung Gar Five Sciences Buddhist Academy is one of the largest and most influential centers for the study of Tibetan Buddhism in the world, inhabited by more than 10,000 monastics and lay disciples. The curriculum includes three parts: Sutrayana, Secret Mantrayana, and common culture, which incorporates the study of language, medicine, Tibetan language, etc. Khenpo SoDargye will speak of the founding and development of Larung Gar and describe the rich and diversified academic programs the Academy provides. Khenpo SoDargye was ordained at the Larung Gar Five Sciences Academy nearly 30 years ago and relied on Kyaabje Khenchen Jigme Phuntsok Rinpoche, founder of the Academy, as his root guru. After intense study, practice, writing, teaching, and development of several charitable organizations, Khenpo has become one of the most influential Buddhist teachers in China. Prompted by a fervent wish to make precious Tibetan Buddhist teachings available to Han Chinese speakers he has translated many hundreds of volumes of sacred Tibetan texts into Chinese and teaches them in an easy, accessible way. He has also translated many classical Chinese scriptures into Tibetan. Khenpo has traveled the world spreading the Dharma in a practical and meaningful way. Pay parking is available in Parking Lots 5, 3, and 2.